Human Fibronectin SimpleStep ELISA® kit (ab181419) has been re-developed with new capture and detector antibodies. This new kit has the same name but a different product number (ab219046). We have identified new recombinant monoclonal antibodies to use in the SimpleStep ELISA platform that provide a higher sensitivity when quantifying Fibronectin in cell culture extracts, citrate plasma, EDTA plasma, cell culture supernatant and tissue extracts. Fibronectin in vitro SimpleStep ELISA® (Enzyme-Linked Immunosorbent Assay) kit is designed for the quantitative measurement of Fibronectin protein in human serum, plasma, milk, cell culture supernatant, and cell and tissue extract samples. Fibronectin is a large glycoprotein present in the extracellular matrix and circulating plasma. Fibronectin is important in many cell adhesion and migration related processes, including wound healing, embryogenesis and nerve regeneration. Differential expression of fibronectin is seen in coronary heart disease, glomerulopathy and tumor cell metastasis. The protein contains binding sites for collagen, heparin and fibrin and is a specific ligand for several integrin adhesion receptors. Fibronectin exists as a dimer or multimer. Our Abpromise guarantee covers the use of ab219046 in the following tested applications. Example of human Fibronectin standard curve in Sample Diluent NS. Interpolated concentrations of native Fibronectin in human serum and plasma samples. The concentrations of Fibronectin were measured in duplicates, interpolated from the Fibronectin standard curves and corrected for sample dilution. Undiluted samples are as follows: serum 1/20,000, plasma (citrate) 1/20,000, and plasma (EDTA) 1/40,000. The interpolated dilution factor corrected values are plotted (mean +/- SD, n=2). The mean Fibronectin concentration was determined to be 126.5 µg/mL in serum, 141.5 µg/mL in plasma (citrate), and 232.1 µg/mL in plasma (EDTA). 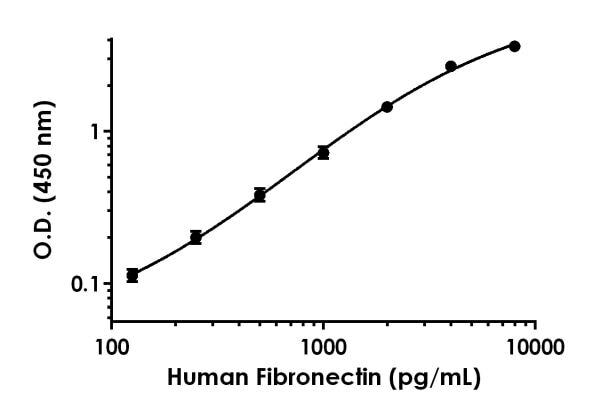 Example of human Fibronectin standard curve in 1X Cell Extraction Buffer PTR. Standard curve comparison between human Fibronectin SimpleStep ELISA® kit and traditional ELISA kit from leading competitor. SimpleStep ELISA kit shows comparable sensitivity. Interpolated concentrations of native Fibronectin in human breast milk and HepG2 cell culture supernatant (4 days) samples. The concentrations of Fibronectin were measured in duplicates, interpolated from the Fibronectin standard curves and corrected for sample dilution. Undiluted samples are as follows: milk 1/100, and HepG2 cell culture supernatant 1/2000. The interpolated dilution factor corrected values are plotted (mean +/- SD, n=2). The mean Fibronectin concentration was determined to be 502.9 ng/mL in milk, and 9683 ng/mL in HepG2 cell culture supernatant. Interpolated concentrations of native Fibronectin in HepG2, SW 480 and U87-MG cell extracts. Interpolated concentrations of native Fibronectin in human HepG2 cell extract samples based on a 25 μg/mL extract load, SW 480 cell extract samples based on a 100 μg/mL extract load, and U87-MG cell extract samples based on a 5 μg/mL extract load. The concentrations of Fibronectin were measured in duplicate and interpolated from the Fibronectin standard curve and corrected for sample dilution. The interpolated dilution factor corrected values are plotted (mean +/- SD, n=2). The mean Fibronectin concentration was determined to be 7085 pg/mL in HepG2 cell extract, 6314 pg/mL in SW 480 cell extract, and 1749 pg/mL in U87-MG cell extract. Interpolated concentrations of native Fibronectin in various tissue extracts. Interpolated concentrations of native Fibronectin in human liver tissue extract based on a 100 μg/mL extract load, heart tissue extract based on a 100 μg/mL extract load, skeletal muscle based on a 100 μg/mL extract load, colon tissue extract based on a 5 μg/mL extract load, and placenta tissue extract based on a 1.25 μg/mL extract load. The concentrations of Fibronectin were measured in duplicate and interpolated from the Fibronectin standard curve and corrected for sample dilution. The interpolated dilution factor corrected values are plotted (mean +/- SD, n=2). The mean Fibronectin concentration was determined to be 7634 pg/mL in liver tissue extract, 4910 pg/mL in heart tissue extract, 4278 pg/mL in skeletal muscle tissue extract, 2684 pg/mL in colon tissue extract, and 1224 pg/mL in placenta tissue extract. 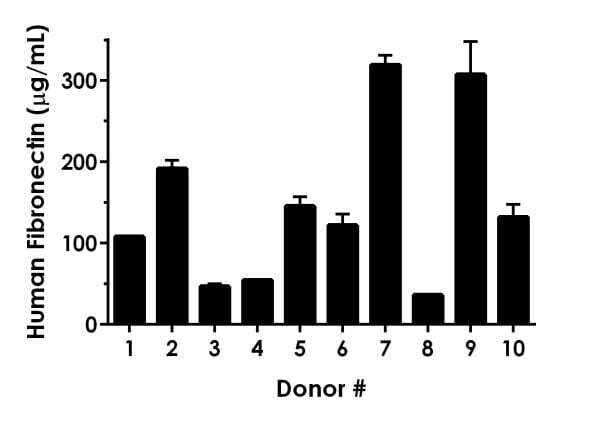 Serum from ten individual healthy male human donors was measured in duplicate. Interpolated dilution factor corrected values are plotted (mean +/- SD, n=2). The mean Fibronectin concentration was determined to be 146.2 µg/mL with a range of 35.99 – 319.2 µg/mL. Interpolated concentrations of native Fibronectin in human cell and tissue extract samples. The concentrations of Fibronectin were measured in three different dilutions in duplicate and interpolated from the Fibronectin standard curve and corrected for sample dilution. The interpolated dilution factor corrected values are plotted in ng of Fibronectin per mg of extract (mean +/- SD, n=3). Fibronectin concentration was determined to be 271.8 ng/mg in HepG2 cell extract, 65.52 ng/mg in SW 480 cell extract, 359.6 ng/mg in U87-MG cell extract, 75.22 ng/mg in liver tissue extract, 47.20 ng/mg in heart tissue extract, 43.52 ng/mg in skeletal muscle tissue extract, 557.9 ng/mg in colon tissue extract, and 998.8 ng/mg in placenta tissue extract samples. Publishing research using ab219046? Please let us know so that we can cite the reference in this datasheet. There are currently no Customer reviews or Questions for ab219046.